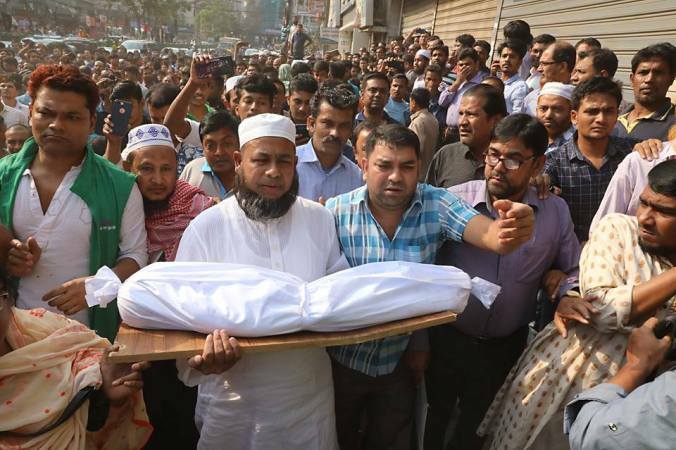 Police recovered the body of a minor boy from a house in the city’s Banglamotor area which remained cordoned off by joint forces since Wednesday morning. The deceased was identified as Safayet, 3, son of Nuruzzaman Kajol. Police also detained Kajol and rescued his son, Surayet, 5, in the afternoon. Abul Hasan, officer-in-charge of Shahbagh Police Station, said it is not clear yet whether it was a murder or natural death. The minor boy had been suffering from Pneumonia for the last couple of days. He also said Kajol is drug addict and his wife left him three months ago as he used to torture her. After several failed attempts, police finally managed to enter the house around 1:50pm and recovered the body. Joint forces, including police, DB and Rab members, cordoned off the house in the morning following information that a man kept his two children confined to it. Tipped off that two minor boys have been kept confined to a room on the first floor of a multi-storey building, a team of police cordoned off the building in the morning, said the OC. “However, police failed to get into the house as Nuruzzaman Kajol equipped with sharp weapons was standing at the main door of the house keeping the door locked from inside barring police from entering it,” he said. Later, DB police and Rab members joined the police and tried to break open the door which was locked from inside.